Professor John McLaren makes the controversial suggestion in a new analysis of the Scottish Government’s Sustainable Growth Commission prospectus for independence. The former UK Treasury economist, who is an honorary professor of public policy at Glasgow University’s business school, said distillers could be targeted as they are unable to relocate. He also said their high profit margins meant they could absorb the extra costs without having to pass price increases onto consumers. The document has already sent ripples through the Scotch Whiskey Association which said the suggestions were a potential job killer. 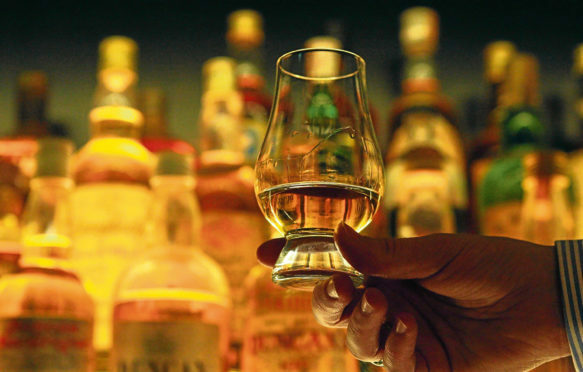 In his analysis, Professor McLaren writes: “As an example, a new Whisky Tax might prove attractive as it is not possible for manufacturers to move production elsewhere if they still want to call it Scotch whisky. The academic floated the idea because he remained concerned about the “decade of austerity” he believed would be required to meet the commission’s targets, although he believed its findings had “moved the independence debate forward” in many respects. Other controversial suggestions to avoid austerity included slashing defence spending from the current 2% of GDP to about 0.7%, in line with Austria, Ireland and Switzerland, or cutting spending to economic agencies such as Scottish Enterprise, increasing income tax across all bands, and increasing charges for services such as health. A spokesman for the Scotch Whisky Association argued last night that raising whisky taxes would put jobs in jeopardy. “Scotch Whisky operates in a competitive, global market place,” he said. “Far from stifling success through additional taxation, our efforts must be focussed on reducing the tax burden on Scotland’s national drink, which already sees £3 in every £4 spent on Scotch in UK collected in taxation. “The Scotch Whisky industry is rightly proud of its contribution to the health of the Scottish economy. “The industry directly employs over 10,000 people in Scotland and supports a further 30,000 jobs through our supply chain. “We have also seen more than £500 million of capital investment across Scotland over the last five years.